I'm making a bunch of pumpkin flavored recipes over the next few weeks, because I love pumpkin. 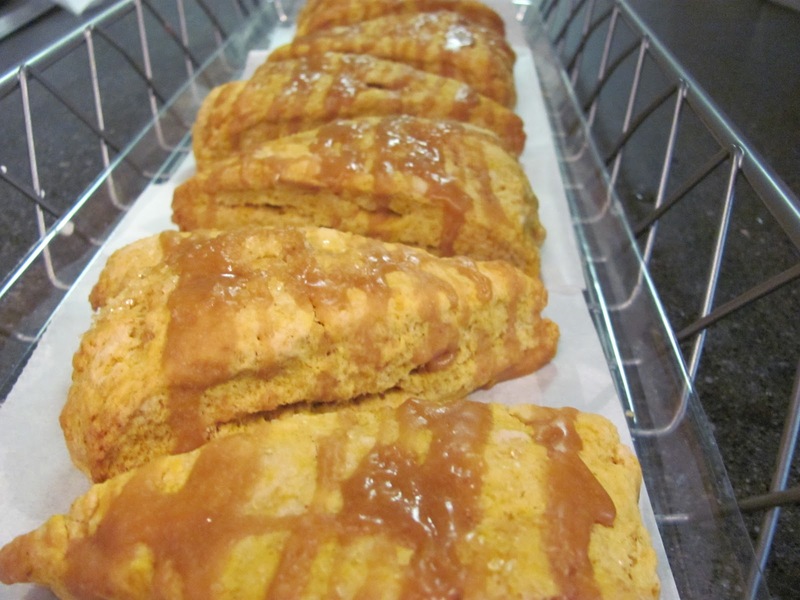 This week I'm sharing a recipe for pumpkin scones. TIP: This recipe works best if you use a fork while mixing everything together. In a large mixing bowl, combine flour, baking powder, salt, spices and brown sugar; whisk with fork until combined. Using a fork, press the butter into the flour until it's crumbly. Add pumpkin and whipping cream to the bowl and stir with the fork until just combined, it should look like big clumps, do not overwork it. Pour the mixture onto a lightly floured surface and use your hands to lightly form into a disc. Fold 3 or 4 times and form into another disc. Pat into a circle about 1" thick and about 10" across. Cut into wedges and bake at 400 degrees F for 10-15 minutes until scones are golden and puffed. Mix everything in a bowl until smooth. Add more milk 1/2 teaspoon at a time until desired consistency is reached. Drizzle over cooled scones and serve! These are so yummy-licious! The ginger molasses glaze has a spicy bite and very nice contrast with the sweet pumpkin. I am so with you on this one Candi! I am craving the pumpkins in everything right now. I am going to break down and buy myself a pumpkin spiced latte today I think! Can you do a summary post of all your pumpkin recipes when you're all done? I'd love to have them all in one place to refer to and I'll post it on my blog and on my facebook page too. These look great by the way, will try them soon! Thanks for sharing! These would make the perfect fall breakfast with a big mug of hot chocolate! Definitely got this one bookmarked! I love anything with pumpkin but I'm especially liking the idea of that ginger molasses glaze. Yum. Oh yum oh yum. A girl after my own pumpkin heart these look to die for! Hope your surgery went well today, thinking of you! Yum! The glaze sounds delicious. I'm so glad it's pumpkin season again! I don't like pumpkin pie (textural problems I think) but I love pumpkin in things and I love homemade scones. These look so yummy and your glaze takes them up 10 notches. Can't wait to try them. I am waiting to start baking pumpkin recipes but this one is too tempting. What a beautiful cookie. Thanks for linking to MMM. I love pumpkin too so I will be looking for your recipes! This one looks great! Imho, one can never have too much pumpkin. Thanks for linking up with the Hearth and Soul hop. I love the thought of these scones with a dark cup of coffee and snuggled up with a book. Yup, heaven. Thanks for linking this to the hearth and soul hop! I've never tried to make scones before but these look great! Thanks for stopping by my blog. Hope you enjoy the soup! YUM! I have a pumpkin scone recipe that I like making. I'm not a huge pumpkin fan, but these I love. They seem pretty similar to what you've shared. Yummy! I love scones but haven't learned how to make them correctly. Here's hoping I can have a little success with your recipe. Thanks for sharing.